“A King Cyrus President” just published! Religious right leaders and voters in the United States supported Donald Trump in the 2016 presidential election for the same reason that all blocs vote as they do: They believed that the candidate offered them the best opportunity to protect and extend their power and create their preferred government. The puzzle of their support, then, is less why they chose Trump and more how they navigated the process of inserting Trump into their story of themselves as a “moral” majority. This self-understanding promotes and exploits feelings of entitlement, fear, resentment, and the desire to dominate to encourage political action. Because Trump’s speeches affirm these feelings, religious right voters were open to writing a plot twist in their story, casting Trump as a King Cyrus figure, as their champion if not a coreligionist. This article analyzes appeals to and expressions of entitlement, fear, resentment, and the desire to dominate from more than 60 sermons, speeches, and books by religious right authors, Donald Trump, and Trump surrogates. Using open coding, it identifies themes in how these emotions are recognized, affirmed, and invoked by speakers, focusing on Trump’s Cyrus effect. The article was released the same week as the film The Trump Prophecy, a rightwing Christian film arguing that Trump is God’s candidate. 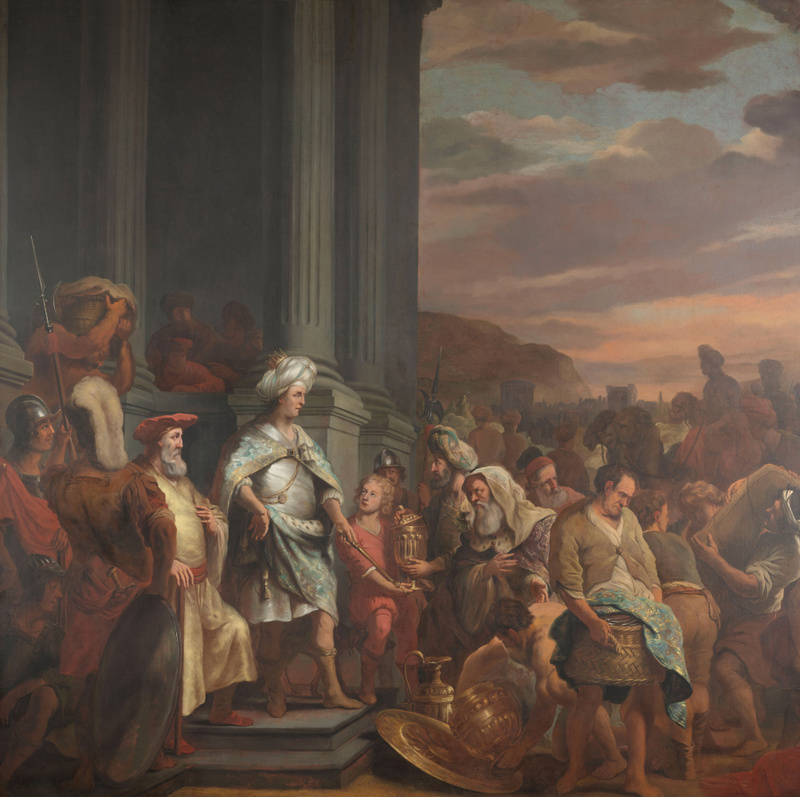 Above, in this painting by 17th-century Dutch artist Ferdinand Bol, King Cyrus returns the treasures of the Jewish temple to the Jews who have been living in Babylon but who have been authorized to return to Jerusalem to rebuild the temple. Conservative Christians view Trump as a King Cyrus–not one of them, but the strong leader who will allow them to reassert their religion with government support. Upon arriving back in Jerusalem, the Jews rebuild the wall around the city, commit to ending pluralism (especially inter-religious marriage), and create a religion that is much more strident than its predecessors. The entire issue focuses on the question emotions in backlash politics in the US and Europe. Special guest editors Joel Busher, Philip Giurlando, and Gavin B. Sullivan have brought together a group of outstanding articles could be usefully discussed together in a class or reading group focusing on the current political moment. I want to share a very warm thank you to Joel, Phil, and Gavin for their leadership on this issue. Joel Busher, in particular, provided invaluable editorial guidance on my (many, many, too many) drafts. His intellectual generosity made this a much more insightful piece, and I’m so grateful. The article is available from Humanity & Society and will be available within the new few weeks in academic libraries. If you don’t have access to it in either of those ways but would like to read it, please let me know and I can help you locate a copy.